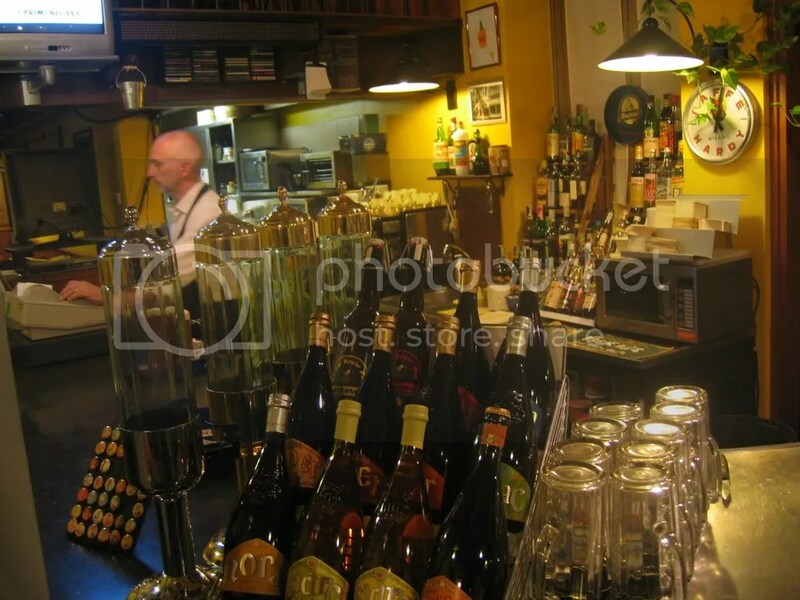 This friendly bar isn’t too far from the centre of Milan, reachable by public transport or a € 10 ride from the Central station. It is in a quiet neighbourhood, and on a Monday evening it was quiet inside, too. Vocal jazz kept pleasantly in the background, this is a place for conversation or finding a corner to relax with a newspaper. Hey, they even played some Paul McCartney classics! A number of local micro beers on tap, most of them from the Lambrate brewery. The emphasis is on Italian beers in their selection of bottled beers, too, with a splendid range of the Baladin beers, for example. A few German beers as well, plus Newcastle Brown Ale on tap if you really need to have it. 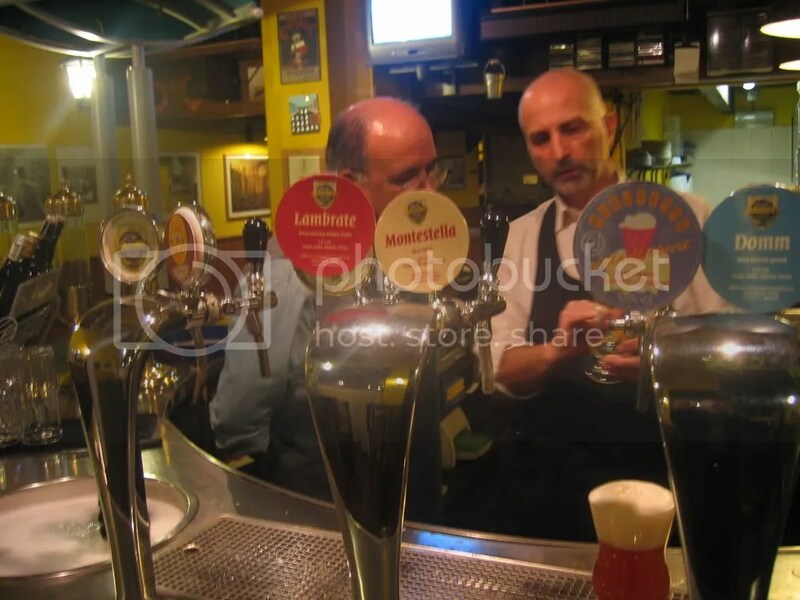 I made my way through the draft beers available, the best of them was Monte Stella from Birificio Lambrate. It is technically an ale, and is entered as a kölsch at ratebeer. It is a good example of how the Italians defy all conventions when they start micros, they don’t waste their time making pastiches of beers from elsewhere. A kölsch is usually a soft beer with subtle malty flavour, while this has been given the full hoppy treatment. Flowers, dust and a dryness that lingers in the mouth. Maybe more a beer for demonstrating the power of hops than for session drinking, perhaps, but I applaud the experiment. The language skills behind the bar are not amazing, but the Italians always get by. They will call over one of the regulars who speak English to translate if necessary. The guests seem to be mostly locals, with some expats in the mix. There is a nice smell from the kitchen, and the menu is dominated by small dishes that you can add up to a full menu if you wish. I have some tortellini with Gorgonzola which suit me just fine. 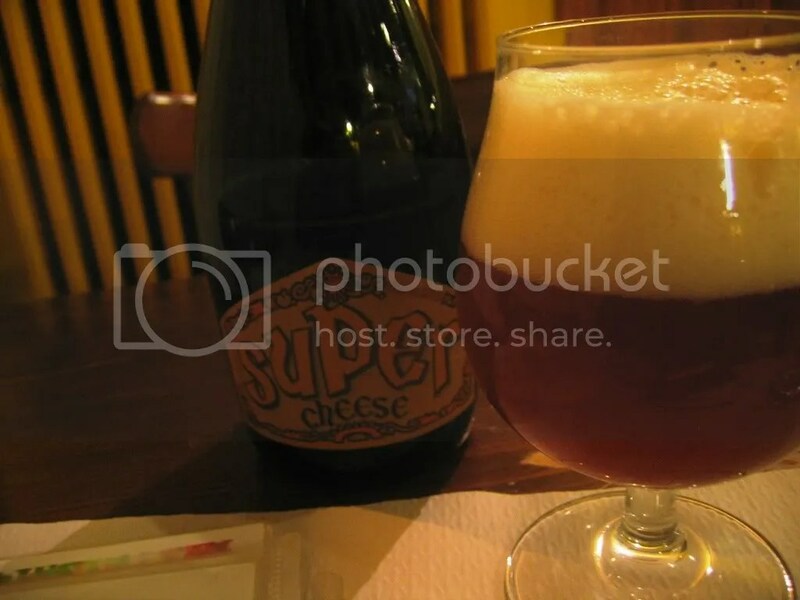 I round up with a bottle of Super Cheese from Baladin, which is brewed to drink with cheese. (In Denmark or the US, they would probably put the cheese in the brew!) This comes in a 75 centilitre bottle, so I have had enough for the night. I would not mind coming back here, though! Some fresh air with your beer? 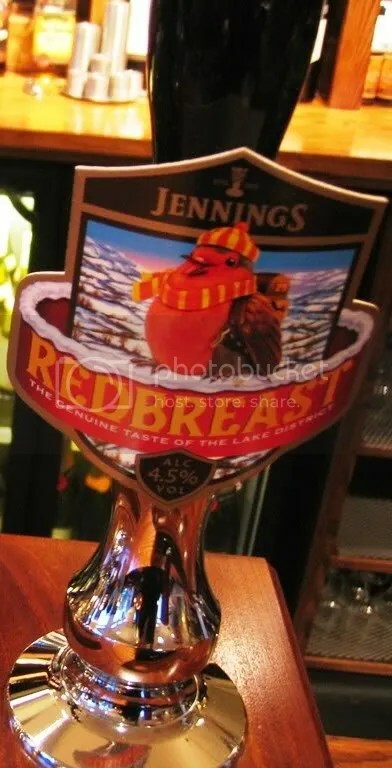 The London Daily Telegraph has an article that enthusiastically promotes the Ale Trail in Cumbria, North England, where you can enjoy the outdoors as well well drawn pints from the many breweries in the area. Good cooking and nice hotels, too, and you can decide how many miles of walking and how many pints you would want to put inot the mix yourself. So many pubs, so little time. It won’t be this year for sure! Thanks to Stig for telling me that I forgot to post the link. The article can be found here. According to Beverage Daily, Rexam has announced that it will build a new beverage can plant in Denmark. The £78m (€112m) new plant, expected to have a capacity of 1.2bn cans in the 33cl and 50cl sizes, will provide another source of supply in a tight market.The aluminium beverage can plant will be built in Fredericia, the first of its kind in Denmark. Rexam expects the plant to be operational during the first half of 2009. The European beverage can market, excluding Germany, has grown annually by 8 per cent over the past few years and is expected to continue to grow at a similar rate. Last month it was InBev who spent a fortune on a slick virtual marketing campaign for one of their lagers, who they would want us to believe is unimproved since the 15th century or something. The new xxxxxx ad, the most ambitious in their history, has not yet been released to the public. We ve hidden it somewhere on the Internet and are relying on savvy web surfers to hunt it down for us by following a tricky series of hidden messages, clues, and puzzles. It s an alternate reality game spread across the web that only the diligent and those willing to thing outside of the box will work out. I am sorry, but I can’t even be bothered to post a link to this nonsense. Please write me again if you have something to say about beer, Freddie. Beer is brewed on malt, hops, yeast and water, not messages, clues and puzzles. That used to be the case even in Dublin! I usually don’t post about music, though there will be a post about beer and music some time soon. 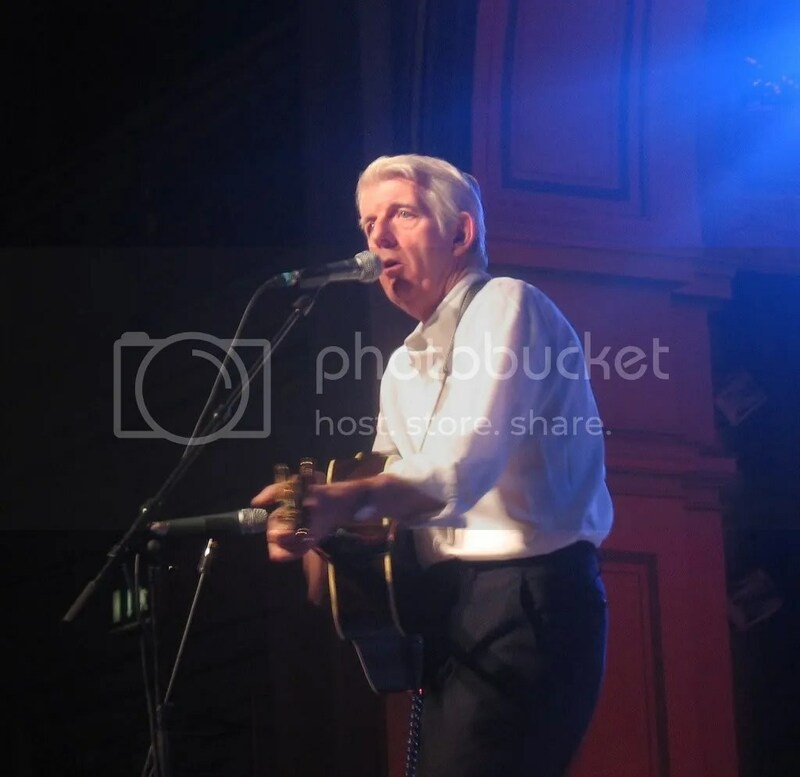 The last time I wrote about Nick Lowe, over at the motime blog, I made that rather thin excuse that he once played in a “pub rock” band. But it’s my soap box, isn’t it? Anyway, Nick played at Gamle Logen in Oslo last night, and it was a wonderful experience. He just walked on stage, picked up his acoustic guitar and began to sing. One man on the gallery mixing sound and light, that was all. But this veteran rocker has a song catalogue that is enough to keep an audience under his spell for an hour and a half. And the beautiful venue, usually used for classical music, was perfect, with none of the chatter you get in the more standard rock clubs in Oslo. The songs were partly from his current album, At My Age, as well as chestnuts from his long career. We got Cruel to Be Kind, I Knew The Bride and Peace Love and Understanding, sure, but for me the highlight was probably Seven Nights to Rock from the often overlooked Cowboy Outfit album. Nick Lowe can carry a show like this on his own, and his voice is probably in better form than ever. But I’d love to see him back again with a band soon – some of the songs are begging for the rock ‘n’ roll treatment. If you find yourself in Milan with a few hours to spare, there are a few real beer finds that I will describe over the next days. Sure, there is art of every category, food, wine and fashion, but that is for others to cover. 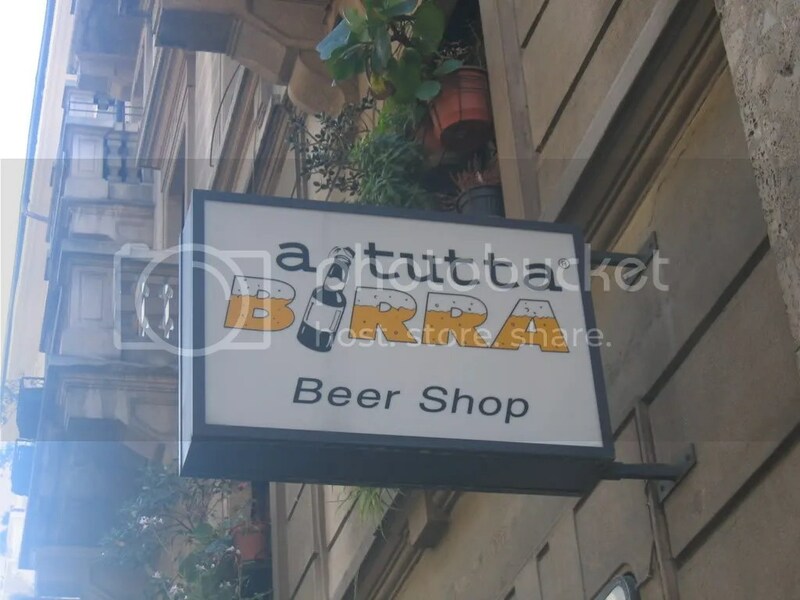 Fifteen minutes walk from Milan Central Station, a granite building that bears the imprint of a not too democratic past, you find a tutta birra – a small shop where they have crammed in an amazing selection of beer and beer-related stuff. There are beer glasses and beer steind, some of them from breweries long gone. There is a splendid range of pewter mugs. 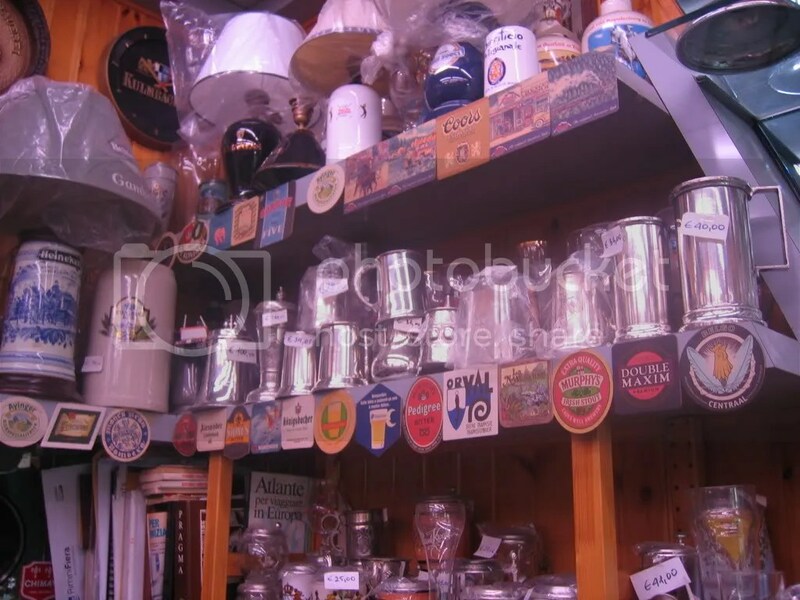 There are trays, key rings and beer books, including quite a few in English. And there is beer. A good selection of Itlaian micros, some splendid US beers, brews from every corner of the British isles. 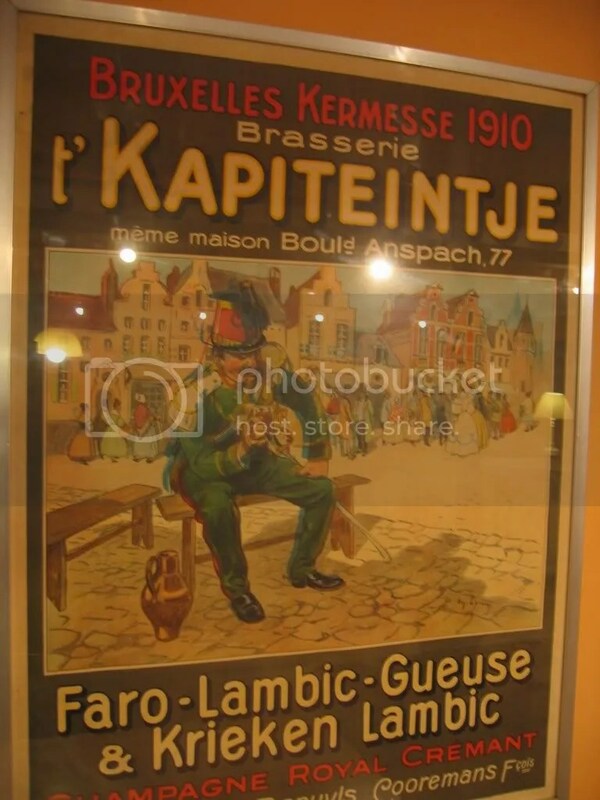 There are lagers from excotic countries, and a broad range of Belgians. Lots of German beers, too, including some from Bamberg. 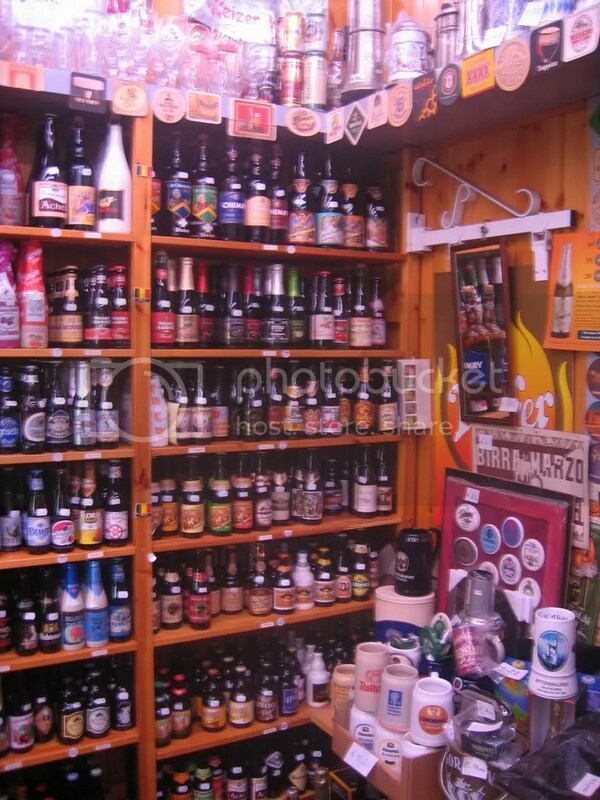 This must be one of the top ten beer shops in Europe! The Italian micros are mostly in 75 cl bottles and are priced at €10-12, most imports are actually a fair bit cheaper. I had a train to catch, so I did not have enough time to drool over the selection. But I – as usual – bought as mucha as I was able to carry. I will come back to describing some of those jewels as they are opened.